Two Decembers ago this photo was taken. Started to notice a huge open little hill lot was in danger and the heavy machinery had been called in to dig it up. But had so much hope that a cool house could be built on this big lot. Maybe a nice two story with a huge grassy yard. Maybe a long single story inna cool style. Then this was taken last September. Damn that is a lot of dirt taken out! Gonna be a big house. Remember driving by and seeing this younger hipsterish dude talking to a couple workers. Thought, hmmm, maybe that is a good sign we'll see some cool architecture for this new house. The 2008 New Year came around when I cruised by and saw this. Looks kinda weird. Why is there several "rooms" in that first level of concrete? Wait, there is no way that they are building townhomes here right? Can't have another disaster like down the road! I am still hoping for the best but I am afraid to drive by and see the latest. 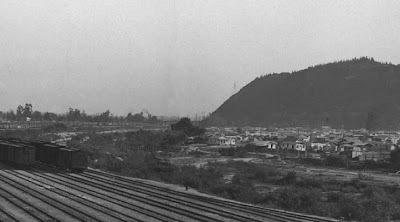 My Morning Jacket "Evil Urges"
Old 1924 pic of homes along the LA River. Sadly the 1938 flood washed them all away.I can't tell what hill that is in the background? In '38, a heavy storm came through and dropped 4 1/2 inches. Then two days later an even bigger storm rolled through and dropped another 5 or so. A lot of the hills and land gave way and turned into a roaring wall of mud. Killing a couple hundred locals. The flood took out around 6,000 houses!! Bill Monroe "The Days Gone By"
Came across this dude way off in his own deal the other day hiking around Deb's Park. It's a great feeling to be up in the woods in our local hills. To be in your own little slice of nature strumming your guitar and harping your harp. No audience. No lame Los Angeles non-dancing crowd. No one there to critique what you are singing about or how you are playing. No one around but the red-tailed hawks and maybe a coyote or two and the other lovely local animals. Get on with it! Derrick Morgan "The Great Musical Battle"
Yonder Mountain String Band "Heading for the Hills"
Oops. Two months ago two girls came up too fast at the rainslicked Ave 43, hit a lightpost and flew into the river on a early stormy morning. Such a sketchy exit. Somehow they were unscathed but their car sure wasn't. Newsmen and women, firemen and women, policemen and women, local men and women all were there to watch and help. Must have been a crazy 1 second in the air for the girls until they hit river bottom. Amazing they were unhurt. Was very cool to feel part of the community with everyone smiling and laughing and in their pajamas. Everyone seemed to be out that morning. Talking and drinking coffee. Even the RIP Diablo dude was there in spirit hanging out. Ice-T "6 In The Morning"
Unfortunately, this tree jumped to his death the other day. I think even more trees have jumped since this photo. They just want to get away from these ugly houses too. Not one house up there has sold, or even been rented(!! ), yet I don't think. Yaaay greedy developers! But thanks though, at least we get to enjoy the amazing architecture. In more happy news, it looks Spring has really gone off around here. Lots of blooms and green mustardy hills, seems I wasn't gone that long. Good to see the rainy season didn't beat down the hill too bad...and gave us all badly needed water.